Canada Trade Deficit Grows To $655 Million. But It's Not As Bad As Was Expected. 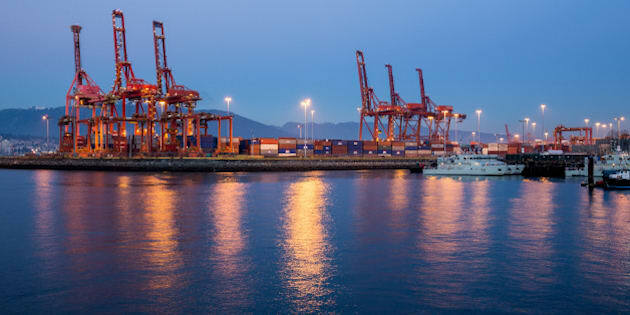 Port of Vancouver in the late evening. OTTAWA — Statistics Canada says the country's merchandise trade deficit increased to $655 million in January compared with $631 million in December. Economists had expected a trade deficit of $1.05 billion for the month, according to Thomson Reuters. The increase came as imports rose 1.1 per cent in January to $46.7 billion, while exports totalled $46.0 billion, up 1.0 per cent from December. Exports excluding energy products increased 2.3 per cent. The deficit came as exports to countries other than the United States fell 3.7 per cent to $11.1 billion in January. Imports from countries other than the U.S. increased 1.1 per cent to $15.4 billion. Meanwhile, exports to the U.S. climbed 2.6 per cent to $34.9 billion in January, while imports from the U.S. gained 1.1 per cent to $31.2 billion.